It’s my line in the sand with director Guillermo del Toro. We disagree on how to say his first name, which is my last name. I pronounce the name the Filipino Asian way. Colonized by Spain, Filipinos have always pronounced it their own way: GILL-yermo. That’s “gill” as in the breathing apparatus of a fish or amphibian. It provides a way toward some fluid common ground. “The Shape of Water” had me at glub-glub. Del Toro’s movie is a fabulistic tale that brings together a mute woman, her gay neighbor, an African American co-worker, and a foreigner who happens to be a doctor/spy, in an effort to save an amphibious god tortured in a government lab. When’s the last time you saw an Oscar-winning best film use the word “vivisection”? But don’t despair. This is really a fantasy date-night movie, with multiple love scenes. In fact, love is the message. If you’re an “other,” no matter what species, this is the movie that will give you hope and speak to your heart. That’s about the best thing a movie can do–help us understand life–in these xenophobic and fear-mongering times. Among all films, “The Shape of Water” led with 13 nominations and won four awards on Oscar night, including Best Picture, Best Director, as well as Original Score and Production Design. Del Toro’s best movie victory capped a night of Oscar diversity that saw historical precedents like the first African American Oscar winner in original screenplay (Jordan Peele, “Get Out”), or the first film winner in which the main character is a transgender actress (“A Fantastic Woman,” featuring Daniela Vega, winner of Best Foreign Language Film). But it was Francis McDormand, Best Actress winner for “Three Billboards Outside Ebbing Missouri,” who got the crowd roaring when she had all the women winners and nominees stand to be acknowledged to let powers that be know the sheer amount of talent in the room with movies and stories to tell. But McDormand’s call to action was uttering the phrase that pays, “inclusion rider.” It was a not so subtle hint to studios and producers to add contract language that would make diversity a requirement for hiring on future projects. Affirmative action? No, just good business sense in a modern world. 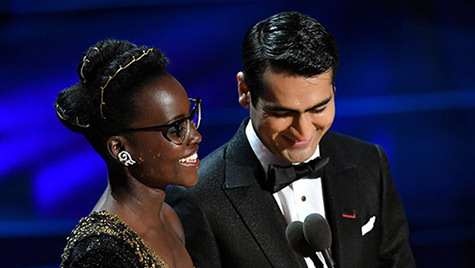 Nanjani, a Pakistani American from Iowa, presented with Lupita Nyong’o, a previous best supporting actress Oscar winner, who is of Kenyan-Mexican descent. They both spoke directly about the impending March 5 DACA deadline hanging over the heads of Dreamers. Fortunately, the Supreme Court has backed lower court rulings that allow DACA (Deferred Action for Childhood Arrivals) to continue while lawsuits to keep it alive are proceeding. That means in spite of Trump’s deadline, if you’re eligible to renew or apply for DACA protection, you should act now. Still, even though Congress and the president remain preoccupied by gun control issues, tariffs, and a White House in turmoil and have done nothing, that hasn’t stopped Immigration and Customs Enforcement (ICE) agents. ICE has raised the Fear Quotient to new heights after conducting immigration crackdowns in Northern California sanctuary cities. More than 200 arrests were made last week from the San Francisco Bay Area to Sacramento. And it doesn’t impact Dreamers, so much as law-abiding people of all ages, many of whom are undocumented. “There’s a war going on now between ICE and sanctuary cities,” Jeff Adachi, the San Francisco Public Defender told me in a phone interview. ICE may be looking for criminals, but they end up snaring tax-paying non-criminals. The people are often detained with no right to a lawyer and placed in custody in detention centers hours from the Bay Area, which make it difficult to get much support from family and friends. Adachi said there are 1,400 unrepresented people being detained in the San Francisco immigration courts currently. His public defenders are quickly trying to reduce that number. They know that with a lawyer, a detainee has a three-times better chance of prevailing in one’s case. If it all feels overwhelming, like you’re drowning in anxiety, it’s a good time to go to the movies–especially on March 5. It’s a world without walls, one that doesn’t define natives and foreigners as “us and them,” but as one. It’s a truth del Toro discovered while following his art. On Oscar night, he passed along his best advice as a movie maker and humanitari an. It was an Oscar-winning invitation to inclusion, to take a deep breath, and to keep dreaming, and not just at the movies.